Brilliant tie-dye art for large groups! Our Color Splash! 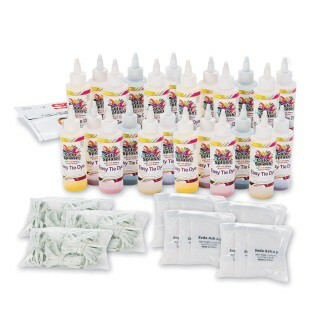 Easy Tie Dye Super Pack has everything you need to create brilliant tie-dye art for large groups! It’s as easy as this: Empty one pre-measured packet of soda ash into each applicator bottle of powdered dye. Fill the bottles with warm water, shake and start dying! These kits include 4 each of the 6 brightest, most vibrant tie dye colors, 24 pre-measured packets of soda ash dye fixative plus 300 rubber bands for wrapping your projects to create amazing patterns. A full-color tips and idea guide is also included. Dye colors: Fuchsia, Orange, Yellow, Lime, Turquoise, and Violet. Powdered dye: 8 grams/bottle, soda ash: 8 grams per packet, 300 count rubber bands. Bottles are 4 fluid oz. Non-toxic. Color name on bottle would be nice! The colors are very vibrant but when looking at the darker powders its hard to tell which color you might be getting until water is added. I think putting the color name on the bottle would be helpful. It would be easier to know which is which when you need to make up another bottle.